The band's music is reflective of their mixed cultural backgrounds. Their heritage covers England, Grenada, the Grenadines, Guinea-­Bissau, Jamaica, Nigeria, Sierra Leone and Zambia. Their musical influences are equally varied and draw from multicultural inner-city London - where all KOKOROKO's members grew up at some point - right across to West Africa. "London is full of a plethora of music styles due to the mixed and diverse immigrant community," said Kinoshi. "I feel that as we are surrounded by such an exciting palette of genres and many of us have grown up around that, it's hard for our compositions not to reflect that. "We are currently working on our own original material and both the instrumental and lyrical songs relate to our experiences as young people in the city and aspects of our cultures and interests," she said. KOKOROKO is a band exploring the history of afrobeat and many other West African genres. The ensemble's name comes from the Urhobo word for strong in Nigeria but also means 'almighty' in Ghana's Akan language. The links to Ghana do not end there, Kinoshi explained. "One of Ghana's popular genres that influences our own compositions and cover choices is highlife," she said. "We play a few songs by the musical pioneer Ebo Taylor such as ‘Love and Death’ and ‘Atwer Abroba’ which were released in the 2000s and feel that his style of writing and subject matter have influenced a lot of the original songs we have been working on." Although KOKOROKO describes themselves as an afrobeat band, this is not exclusively what they play. "We will always be focusing our attention on exploring the music of West Africa and other areas of the continent and I don't think this will change at any point," said Kinoshi. The band was formed by trumpeter and bandleader Sheila Maurice­-Grey and percussionist Onome Edgeworth two years ago after a trip to Kenya. Other core members are Kinoshi, Richie Seivwright (trombone), Oscar Laurence (guitar), and Mutale Chashi (bass). All of the horn players also double as vocalists, she said. The band performs with drummer Pharoah Russell but have collaborated with drummers YussefDayes, Eddie Hick, Patrick Boyle and Israel Shabani in the past. "Most of us are professional or 'full-time' musicians earning our living through performance, musical education, session work and other music-­related avenues," said Kinoshi. South-east London has a thriving jazz and jazz-­related music scene and KOKOROKO band members have been part of that growth. Kinoshi established her own 10-piece ensemble SEED. Both Laurence and Maurice-Grey have previously performed in SEED, while NERIJA is a septet collective Maurice-Grey, Kinoshi and Seivwright have performed in. “The circles are quite tight and you'll find that a lot of the bands that come out of this scene share the same musicians,” said Kinoshi. Kinoshi believes that working as an emerging jazz musician, while although incredibly rewarding, can also be a struggle. For her, this is why platforms such as Jazz Re:Fest, which is organised by Jazz Re:Refreshed, are important spaces for the collective to play on. "There is not that much support for up and coming, young ensembles in the city and having a safe, encouraging space to present new music within is an integral part of allowing the creative music scene to flourish both as a community and musically," Kinoshi said. KOKOROKO’s sound has been warmly embraced by the public - many of whom are regularly up on their feet dancing. “Afrobeat and highlife music are not only there to present messages to those listening but to uplift or intrigue by causing people to dance. Every audience we have had has danced which, especially on instrumental tunes, creates such a connection between us as players and the audience without any words having to be spoken," said Kinoshi. The reception from the Black community in London has also been positive. 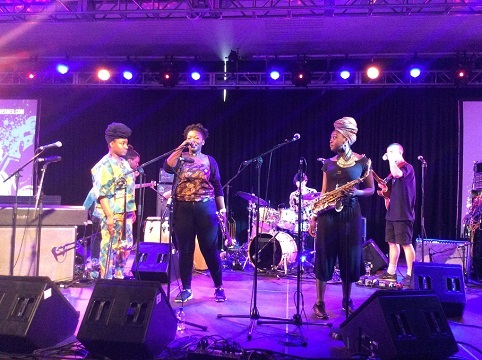 "It's especially wonderful when older Nigerian or Ghanaian audience members reveal to us how excited and happy they are to see young people playing afrobeat and highlife music and know that we are re-­kindling feelings from their memories of growing up with this style of music,” said Kinoshi. To hear more from KOKOROKO, check the band will be performing some of their new material as part of EFG London Jazz Festival on 20 November. Or check out the following link here.